Despite the low unemployment rate in Singapore, the number of people being made redundant or laid off is creeping up. According to the latest numbers by Ministry of Manpower, citizen unemployment rate has crept up to 3.5% over Q1 2017. The overall number of people employed in Singapore plunged, hitting a level not seen since 2003, during the severe acute respiratory syndrome outbreak. In my current day job, I get to work with many unemployed Singapore PMETs to help them find their next career. Some were recently made redundant, many have been out of work for a year or two. Getting back to the job market in the current climate is tough, not aided by the structural changes happening in the market. There had been lobbies from a number of politicians about greater support for unemployed Singaporeans but consistent with past policy, it wasn’t a consideration by the Ministry of Manpower. Which got me extremely interested in learning more about Bandboo when one of their co-founder connected with me. Instead of waiting for another year of no action, they took the matter into their own hands and created a platform that provides unemployment insurance for Singapore workers. Bandboo is an insurance platform which enables users to enjoy insurance coverage at the lowest possible cost without going to an insurance company. Members join digital communities on our platform, which runs on blockchain technology. Premiums are used solely for paying out claims. At the end of each membership term, premiums not used are fully refundable. To enjoy this service, members have to pay a nominal membership fee, which helps to sustain the maintenance of our platform. The payment mechanism is similar to taking public transport: You pay to purchase an EZ-Link card. With your EZ-Link card, you can top it up and a deduction is made only when you take a trip. When you return your EZ-Link card to the transport company, you receive a refund of the remaining balance in your card. At Bandboo, you pay to become a member. As a member, you top up your Bandboo Account with your premium and a deduction is made only when there is a claim. If you leave the platform at the of your membership term, you receive a refund of the remaining balance in your Bandboo Account. Each membership term is fixed at 1 year. 3. What are the key benefits that your product brings to the market? 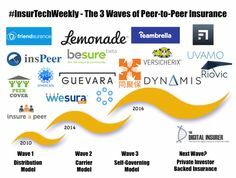 We believe there are three issues with the current insurance landscape. Insurance companies pay claims off their balance sheets. Profitability year after year is possible only if they collect more premiums than they pay out in claims. As every dollar paid out in claims is a dollar less in profit for the insurance companies, this incentivises them to make it especially onerous for policyholders to successfully file a claim. We collect a nominal membership fee for customers to join the platform. A premium is also collected, and it goes toward covering claims only. Whether we pay out 1 or 100 claims does not affect our profitability. This removes any conflict of interest inherent within traditional insurance. Policyholders do not how their premiums are calculated and do not know what they are used for. All transactions that take place on the platform are logged onto our proprietary blockchain ledger. This ledger cannot be altered and allows for an easy audit trail. Any member can view the ledger online to know what the claim payouts for a particular month are and whether other members have paid their premiums and membership fees. This ensures that there is a high level of transparency in our operations. No insurance company in the world opens up their books to the public like we do. Insurance is too expensive for many, leading to underinsurance for a large percentage of people. We provide a 100%, unconditional rebate of premiums not used to pay out claims. Essentially, members pay only when necessary. If there are no claims the entire membership term, all premiums collected will be refunded. This allows our members to enjoy insurance coverage at the lowest possible cost. 4. Are there any alternatives in the market? 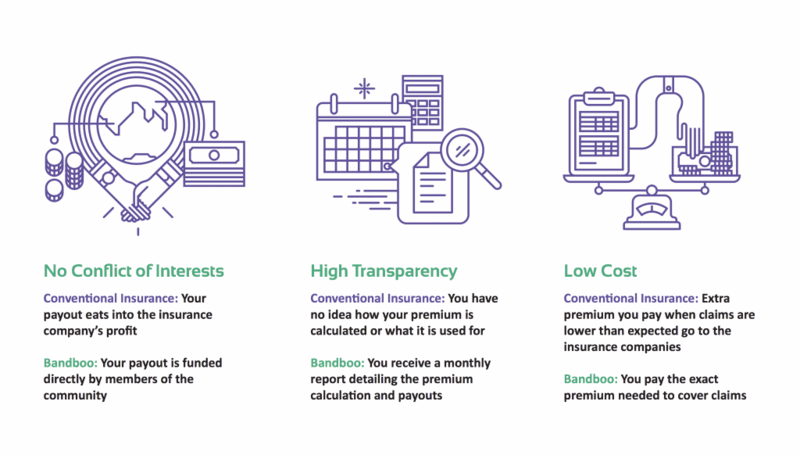 Bandboo is the only insurance-enabling platform in Singapore. No other similar platform has ever existed in Singapore. A key obstacle to creating such platforms is the lack of trust among people. How is anyone to be sure that a stranger in the community will pay his premium dutifully? Or that there are sufficient funds to pay them when they file a claim? Bandboo has eliminated this doubt with the use of our proprietary blockchain technology. Now, all payment records are stored in an open and immutable ledger. Any member can verify them any time to confirm that everyone has paid and that there is sufficient money in the pool should they need to file a claim. With regard to our product (community), there is currently no unemployment insurance in Singapore. The closest could be ComCare financial assistances from our government. However, these are mainly for people whose financial situation are in a dire state. In fact, it is worrying that there is a rising trend of Singaporeans falling into this category. The Bandboo Unemployment Insurance aims to prevent more people from falling into poverty. We hope to help Singaporeans tide through with their finances when they are retrenched, such that they can focus on their job search and/or skills training without too much worry about paying off their basic bills. 5. Are there similar concepts outside of Singapore? There are similar concepts overseas, such as Lemonade from USA and Friendsurance of Germany. They have been very well received by the public. 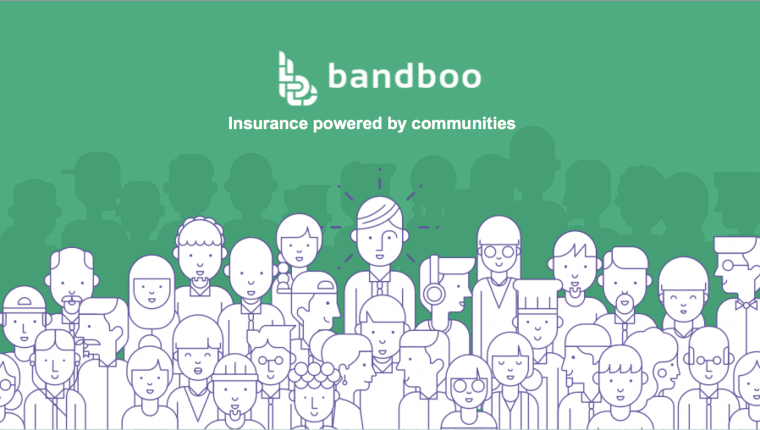 While these companies adopt a form of peer-to-peer insurance, we are proud to say that Bandboo is the only platform which provides a 100%, unconditional rebate of unused premiums. For the Bandboo Unemployment Insurance, members pay a membership fee of $9.99 a month to join. The premium charged is $420 a year, with unused premiums fully refundable at the end of each year. We have another similar product, Bandboo Retrenchment Benefits. It aims to help companies exercise fair and responsible retrenchment at the lowest possible cost. Interested HR managers/business owners can contact Bandboo directly to find out how their companies can enjoy this service. Keen to learn more about Bandboo?